There’s a famous quote about fashion genius, Miuccia Prada: “When others zig, she zags.” It’s the perfect line to sum up Linda Stephenson, founder and CEO of Canadian beauty brand Mèreadesso, which is now available at Nordstrom. In an industry where everyone is adding more products – some skincare regimes now have up to 20 steps – Stephenson is stripping things right back to just two. Merèadesso’s Face + Neck Cleanser ($45) comprises a gel cleanser and cleansing cloth that cleanse, exfoliate and remove eye makeup. All-In-One Moisturizer ($120) functions as day/night moisturizer, mask, eye cream, serum and primer. Both products supposedly suit every skin type. The rationale behind the line? Modern cosmetic science means that we really don’t need to do all this layering – umpteen active ingredients can be combined in one product without affecting their efficacy. And anyway, as with anything, consistency is king: the best product is the one we’ll actually use, all the time. Stephenson, who has degrees in chemistry and botany, started her career developing products for M.A.C and went on to work with many brands within the Estee Lauder group before striking out on her own, first as a consultant and then with Mèreadesso, which was founded seven years ago. It’s targeted at anyone who has a busy life, or who is perplexed with the excess of choice at beauty counters now. “The initial idea came to me years ago when I was pressed for time and trying to buy toothpaste. I ran in from the car, and suddenly, I had 76 choices. I’m reading boxes: Am I pro-health? Sure! But do I want whitening too? Of course. Is Winter Fresh like Spearmint because I don’t like Spearmint? And it’s three companies that are making all 76 choices! I didn’t know what to choose, and I didn’t want to compromise on anything,” she explains. She describes the brand’s cleanser and moisturizer as a buffet for the complexion – there’s everything you might need, and your skin chooses what to take. “For example, the moisturizer contains 20 antioxidants, plus minerals, enzymes and botanical extracts.” Both products can be used by people with any skin concern, from oiliness to extreme dryness or teenaged pimples to serious wrinkles. Most big brands make their money by adding more and more products and lines – this eye-cream primer, that range for teens. It’s a tactic that won’t work for Stephenson. Right now, as well as the cleanser and moisturizer, she has a tinted moisturizer, a lip balm and two tinted lip balms. Next, she’ll be extending the range of colours for the lip balms and relaunching her Body Balm. She plans to release hair products and possibly fragrances in the future. 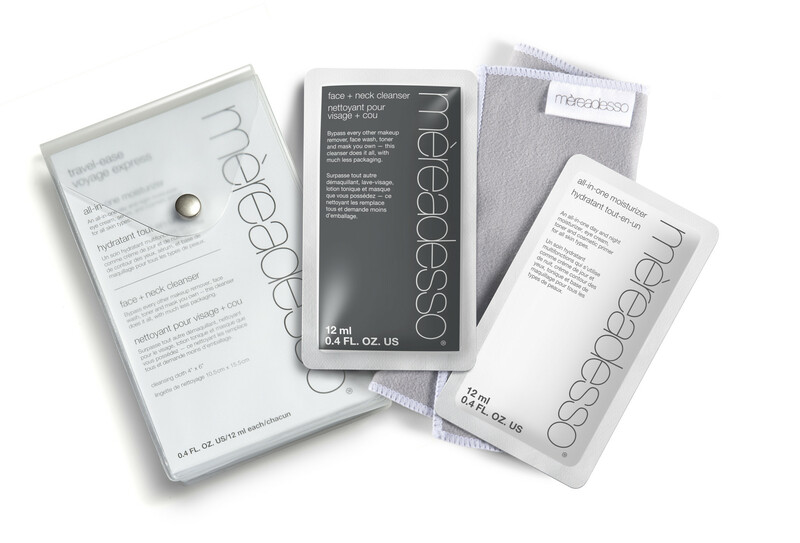 One of her biggest sellers is the Travel Ease Kit ($45), which comprises a two-week supply of cleanser and moisturizer in resealable sachets, plus a cleansing cloth and travel pouch. She has no intention of adding SPF to her products or developing her own sun protection. “Brands like Ombrelle and Neutrogena have that covered,” she says. At the end of our meeting Stephenson challenged me to ditch all other beauty products and use only Merèadesso for a fortnight. This, she said, would give me softer, brighter and more hydrated skin. “In about six applications (three days) you should start noticing a difference in the appearance of your skin. In about two weeks, people will start commenting. The moment people think you’ve had work done, my job is done,” says Stephenson. The first thing to note about the products is the texture. Both are thin and runny – they don’t have the rich and balmy texture of many beauty products. But the cleanser and cloth do remove makeup (even waterproof mascara) effectively. Skin doesn’t feel dry and tight hours after the moisturizer is applied, and its green tint counteracts redness. The lip balm is unremarkable for hydration, but does prime my lips so that lipstick or gloss applied over the top lasts far longer. As to whether friends have commented on my skin? A definite no – I would say my complexion remains the same after my Mèreadesso experiment. But here’s the thing: I’m extremely diligent about my skincare. I always remove my makeup at night and always wear serum, moisturizer and sun protection. This means is that my complexion is probably as good as it’s going to be without a dermatologist or surgeon’s intervention – not perfect, by any stretch of the imagination, but well-maintained. If a simple two-step regime can do the same as the five or six steps I usually use, then it’s a winner. It’s two minutes in the morning and two at night, versus 10 or 15 minutes, which allows more time to spend with my family, start that elaborate exercise regime, or, let’s face it, hit the snooze button and go straight back to sleep.